From renowned cherry festivals in Traverse City to air shows in Battle Creek, Michigan celebrates America’s independence in a variety of interesting ways. One thing is for sure, you’ll never be without something to do on July 4 here. Whether you’re looking for a more traditional firework display or an international food festival, check out the best July 4 events in Michigan! The Ludington Freedom Festival in Ludington has run every year around the Fourth of July since 1874, and with that kind of experience, you know they know how to do it up right. 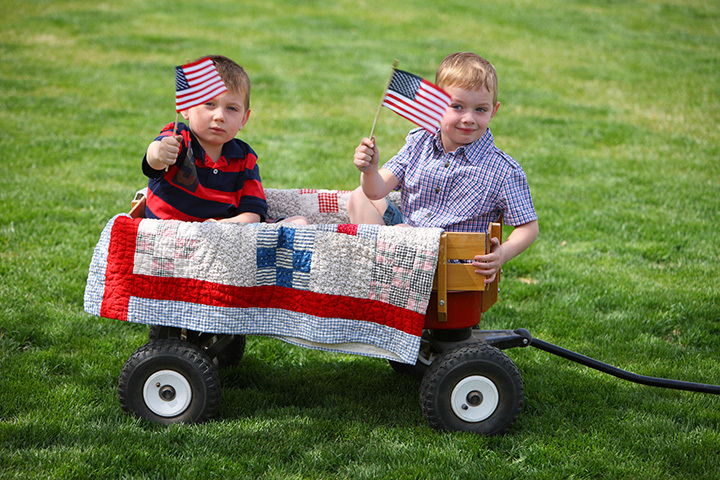 It starts on July 3, with a Children’s and Pet Parade, featuring kids decorating bikes and pets dressed in patriotic finery. On July 4 the Freedom Festival Grand Parade takes place featuring the Scottville Clown Band among other things, and the whole affair is capped off with an exciting firework show. Come with your family and watch the festivities unfold. Harbor Springs knows how to put on a Fourth of July event like few others. Not only will there be a grouping of marathons—in both three-mile and 10-mile increments, dubbed the Paul Revere in celebration of the cautious silversmith who warned of the British advance—but there will also be a highly unusual parade afoot as a phalanx of bagpipers marches down Bay Street before marching directly through local business the Stafford's Pier Restaurant which culminates in a dining room concert. Boyne City will be putting on an impressive event. Some of the high points include the interactive Commemorative Raft Race where you are invited to throw water, as well as the Children's Pie-Eating Contest at Veteran's Park sponsored by the area Kiwanis and Family Fare Supermarket. This great event also offers bike and costume parades, an annual duck race, arts and crafts show, chicken barbecue, and naturally, fireworks. Lake City delivers quite a claim, that it's got the “Greatest Fourth in the North.” Running from June 29 to July 4, it's easy to see why they're making such a claim. Featuring not only a large-scale parade and fireworks show—which is pretty much standard for any Fourth of July event—but also booze-infused painting classes, craft beer & cider tastings, vendors, crafters, and a carnival specifically for the kids. Oh, and they'll also give away a car. A free car could be waiting for you thanks to an array of sponsors, this year, local businesses Classic Chevrolet, Lake City Tap House, Imbigr Handyman Services, and more. For a slice of serendipity, check out the Battle Creek Field of Flight Air Show and Balloon Festival, whose last day is July 4. It starts June 28, and offers an array of attractions for the entire week. The festival features a half marathon and 5K, and will boast rides, games, and an array of other shows beyond that. If air shows, a carnival, marathon, lumberjack shows, and motorcycle stunt shows weren’t enough excitement for you, check out the two fireworks shows to follow, on Saturday (rain date on Sunday), and on Wednesday. While the air show was a slice of serendipity, Traverse City's National Cherry Festival incorporates the Fourth of July into its standard slate of events. Running June 30-July 7, the event features a cherry pie eating contest, a pow wow for the Grand Traverse Band of Ottawa and Chippewa Indians, a 1990s dance party, and of course, fireworks. The cherries, however, won't be overlooked here as a cherry farmers market will be on hand to serve its customers as well. When you're right across the lake from Chicago, you've got to put a little extra juice into your Fourth of July celebration, and St. Joseph understands this quite well. To that end, there's an Independence Day concert that day at the Shadowland Pavilion at Silver Beach. Featuring an array of patriotic favorites followed by fireworks along to classical music played by the symphony, you'll get access to food, drink, and plenty more music to cap off the celebration of American freedom! Running July 2-4 in Marquette, the International Food Festival represents a look at not only everything the area has to offer, but also everything else the rest of the world can offer. Asian, German, Italian, and Mexican food will lead off, and plenty of others will follow with booths available from noon to 10:30 p.m. daily. While the food is the clear draw, the event will also feature live music and fireworks. For those out there who want their Fourth of July fun a little ahead of schedule, the Henry Ford Museum in Dearborn has you covered. Running June 30 through July 4 is the Salute to America event, an event that brings together the Detroit Symphony Orchestra and the Jazz Ambassadors of the United States Army Field Band to perform a variety of favorites, including the 1812 Overture, backed up by not only authentic cannon fire, but also fireworks. Yes, we know that fireworks are a big part of the Fourth of July anywhere you go. But Bay City is taking things one step further by offering a complete festival devoted to the aerial explosives. Along with the celebration of pyrotechnics, there's also a complete carnival and vendors offering a variety of goods for sale. With AT&T as a sponsor—they even have a VIP viewing area set up to watch the fireworks go off—it's clear that this is one very big deal. Great part about the fireworks is that they go all the way to the end of the week, July 5 -7. View more Michigan July 4th Fireworks and Celebrations.